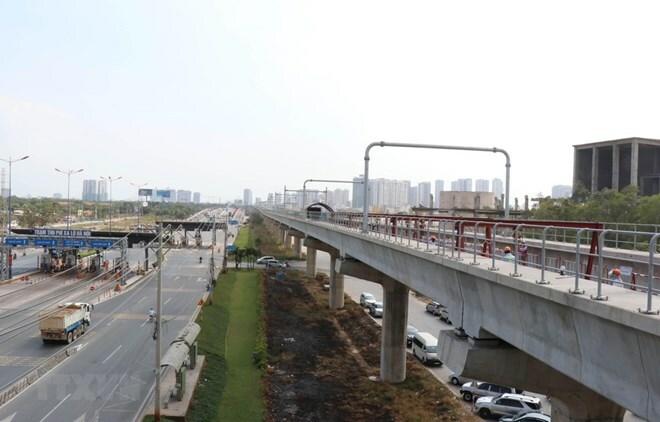 HCM City (VNA) - The HCM City People’s Committee has approved an advance of 2.1 trillion VND (93 million USD ) from the city budget for metro line No 1 project between Ben Thanh Market and Suoi Tien Tourist Park. The city’s People’s Committee has directed the city Department of Finance and State Treasury to undertake advance procedures for the city’s Management Authority for Urban Railways (MAUR). The city’s People’s Committee has also directed the MAUR to be responsible for paying the contractors according to regulation and work with related units to complete the process of adjusting the total investment of metro lines No 1 and No 2. In addition, the MAUR must focus on solving difficulties to speed up the disbursement process. According to the MAUR, the late payment to the project’s contractors is due to the fact that the project is in the process of adjusting the total investment so it cannot be funded by the Ministry of Planning and Investment. The metro line No 1 has completed 62 percent of the project.